Most of us think of droughts as when there's no rain at all. But actually they can happen when there's less rain than people thought there would be. 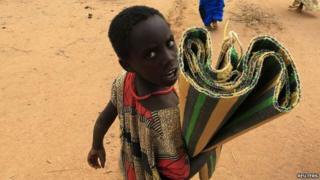 It usually happens over months or even years, when an area, like East Africa, doesn't have a big enough water supply. Unlike other natural disasters, droughts happen very slowly over time. 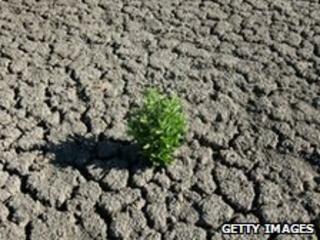 Droughts happen when there is not enough rain for a long period of time. It's not like a dry spell - there is so little precipitation (rain, snow, sleet or any kind of moisture) that a whole region starts to dry out. Sometimes a drought takes decades to develop fully and they are very difficult to predict. Environmental things like climate change, ocean temperatures, changes in the jet stream, and changes in the local landscape all make a difference when it comes to droughts. 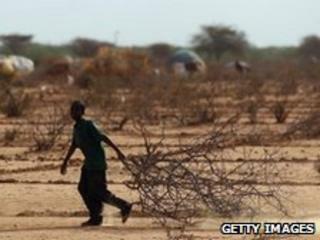 Droughts can be very dangerous for people in living in areas with not enough food or water. Deaths can happen from lack of food and water, and there are lots of health problems too. When there's not enough water, crops fail, which means there isn't enough food to go around. It also means that farmers lose money, and the area can become very poor. When a region is very poor and doesn't have enough food or water, arguments can happen over who should be able to access the goods, which can escalate into wars.